Making a good comeback this Kasalang Filipino 2007 roadshow run is Dagupan City with a big state-of-the-art venue and potentially the biggest wedding supplier gathering up North. Held last Oct. 6-7, Kasalan sa Dagupan wedding fair presented the diverse wedding suppliers of the North via the City’s new and modernized event venue CSI Stadia in Lucao District. The venue can easily accommodate intimate celebrations with its small function rooms and the largest wedding gathering with its 3, 693 sqm. main hall. Not to be outdone, known wedding venues in Dagupan like Patio Elmina Inn Asia, City Deluxe Restaurant, Dagupan Village Hotel, Leisure Coast Resort, and the ever-popular Star Plaza Hotel rivaled in booth design creativity and elegance. Hotels and resorts from towns as near as Urdaneta to as far as the province of La Union - like Lisland Rainforest Resort in Urdaneta, Covelandia in Labrador, Hotel Consuelo in Lingayen, and Nalinac Beach Resort in Bauang, La Union – also joined the event and introduced their wedding and honeymoon packages to to-be wed guests. Gloria Maris in Dagupan, the event’s major sponsor and official caterer of CSI Stadia, showcased not only its culinary prowess but also its skill in creating thematic wedding displays. From Chinese lauriat to garden wedding ambiance, the people behind Gloria Maris can provide both. Henry Pascual, one of the country’s known event stylist, graced the event and shared to fellow wedding suppliers the art of floral styling. Members of the Fashion Designers Association of the Philippines (FDAP) led by Johnny Abad also lent support to the event and presented their modern take on Filipino wedding fashion. 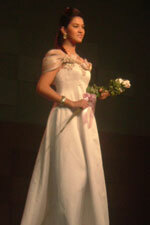 Kasalan sa Dagupan was culminated with a special wedding fashion show by the City’s known fashion designers. 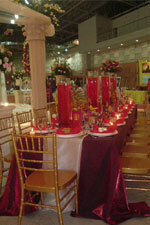 Please visit www.kasal.com for the Kasalan sa Dagupan exhibitors' complete contact details.